Kirati, Kiranti is an ethnic group with roots going back several millennia distinguished by separate beliefs, traditions and language between Nepalese. Their tribes are also found in the regions of Mechi and Koshi. Nowadays, Kirati’s religion is a syncretism of the age-old shamanism of these tribes, Tibetan Buddhism and the idols of the Hindu pantheon. Their shamanism focuses on the spirits of their ancestors, the forces of mother nature, the power of sun and moon, fire and wind, and the role of the main pillar of a residential home. A large number of Kirati families declare faithfulness to the holy book of Mundhum. The book is a compilation of various elements of this ancient culture – customs, rituals and myths passed down by the ancestors – traditions in force long ago, even before the advent of Vedic civilization. Mundhum, moreover, the distinction between individual tribes and people other than Kirati, also includes the ancient law code of this group. One of the most important figures of this caste is Birupakshya, also known as Kirateswor Mahadev or Shiva Paruhang Mahadev. His character was erected by one of the ancient kings, now it is in the Pashupatinath temple in Kathmandu, only half visible. It is claimed that the historical figure behind this cult is the prototype of the later, worshiped Shiva. According to the sacred books about the extraordinary beauty of Parvati, Shiva’s wife had to come – just like Shiva himself – from the ancient Kirati family. In the history of the lands of Nepal, the Kirati families are recorded to be the first rulers. Yalamber – the great king of Kirati – whose image can often be found in the homes of the caste people, is considered the first king in the history of this country, when he reigned here about 3,500 years ago. The story tells how King Yalambar went to the battlefield dressed as a powerful Bhairava during the great Mahabharata battle. Asked by Lord Krishna who he wants to help, he replied that he would support the losing side. Krishna, hearing this answer, immediately cut off the head of King Yalambar. Yalamber enjoyed great respect because, according to the beliefs of the subjects and also the neighboring tribes, he gained his strength through tantric practices, his head was preserved as the head of the great Akash Bhairava – the guardian of the right wishes and actions. Bhairav ​​is now worshiped by all Nepalese people, and Akash Bhairava has his own temple at Indra Chowk in Kathmandu. 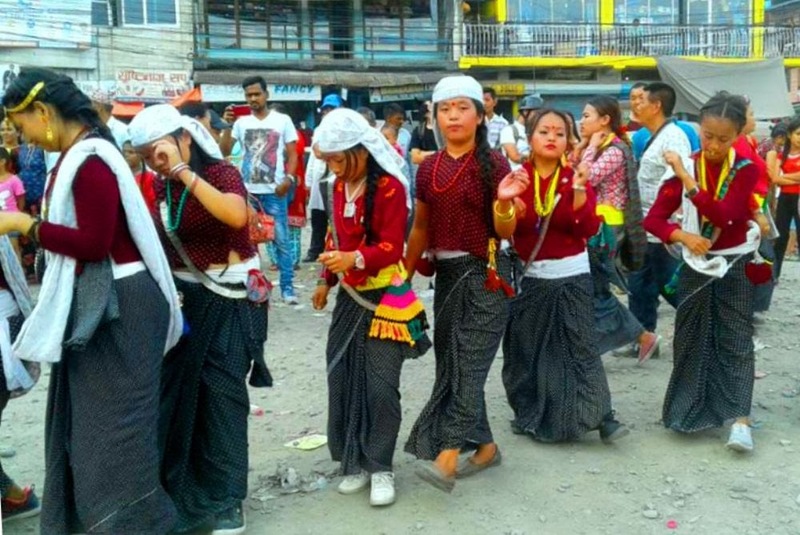 The memory of the first king of Nepal returns every year in September with the Yenya festival – differently Indra Jatra – when there are numerous dances and processions in the center of the capital and in other ancient cities of the Kathmandu Valley. For eight days of the Indra Jatra festival, the celebration includes the decoration of Akash Bhairav’s head and the temple itself. This is accompanied by offering and other rituals. The cycle is connected with the bird migration cycle, as in the old days people in these seasons also migrated. 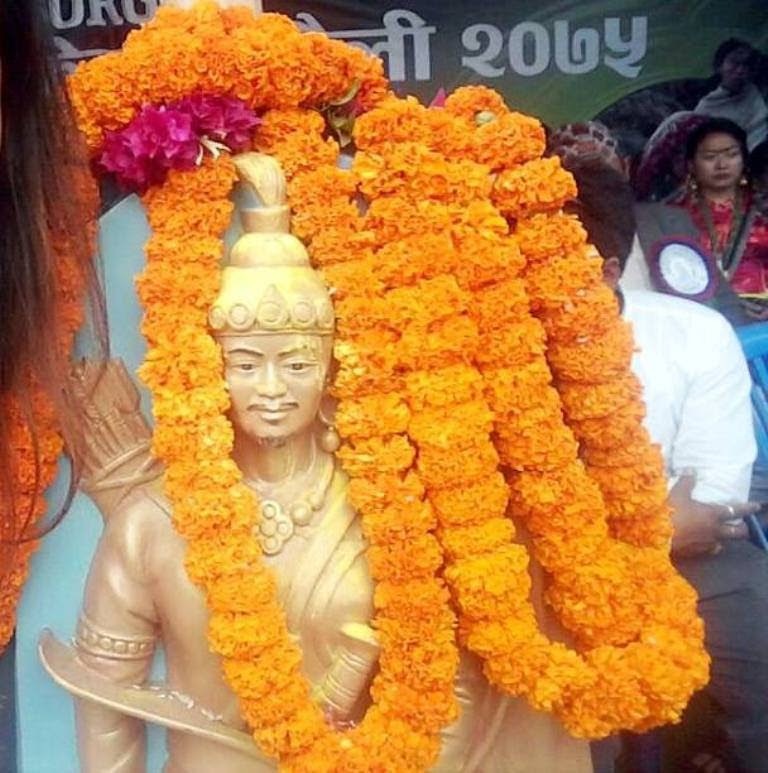 Every year, Ubhauli celebrates on the day of Baishak Purnima, which is usually the same day as Buddha Jayanti – on the full moon of the Baishak month of the Bikram Sambat calendar. Baishak falls at the turn of April and May. Udhauli falls in the month of Mangshir, Bikram Sambat, November – December. In the summer, after the Ubhauli rituals were celebrated, Kirati people used – according to tradition – to travel higher up into the mountains to avoid heat and epidemics of malaria. During these rituals they praise their ancestors and the forces of nature, counting on prosperity and good harvest. Similarly, at the beginning of winter, they perform the rituals of Udhauli and then go back into the valleys. Kirati people have upheld the memory of their ancestors and respect for the forces of nature. They believe that the spirits of their ancestors could fall into anger, if they were not worshiped properly. Although the rituals have been unchanged for centuries, the practice of seasonal hiking is no longer maintained. The ritual begins with singing and offering. Nakchhong, community leader, sacrifices a chicken in a place called Sakela Than, which is usually under a sacred tree. He tells the story from the holy book of Mundhum, how their ancestors traveled through Dudh Koshi, Sun Koshi and Tama Koshi, and finally settled on the coast of the river Bhote Koshi. Then Kiranti dressed in traditional costumes dance together, in a circle, Silli dance, guided by a man and a woman – Silimangpa and Silimangma. Silli is the most important element of the Sakela festival. This style reflects different aspects of human life and the relationship between man and nature. Its elements are steps similar to the steps of ducks, river birds, black bird (calchage), deer, muskrat and other animals. Silli’s dance is a continuation of the old legend of this people speaking about the marriage of beautiful Sumnima and Paruhang. Sumnima gave her husband four children, and then Paruhang left without saying anything to meditate in the caves of Chomulungma (in the Everest region). After her husband’s late return and the explanation of such a long absence Sumnima finally accepted from him the promise of never leaving the family again, which she expressed with a dance of joy. This legend stands behind the annual Silli ritual. Sakela ritual is known among some Kiranti tribes as Chandi Nach Murat. Chandi or Chandika is another name for Durga from the Hindu pantheon. This, and several other rituals and festivals, make Kirati more strongly baided with the Hindu tradition. Among other festivals important to these people, we should mention Deepawali, or Tihar or otherwise Lakshmi Puja.